This traditional Spanish dessert have been pretty popular among Singaporeans recently. Deliciously crunchy texture dusted with cinnamon sugar dip in chocolate sauce, irresistible! No wonder the long queues despite the high price. Basically this dessert is just another version of deep fried doughnut. 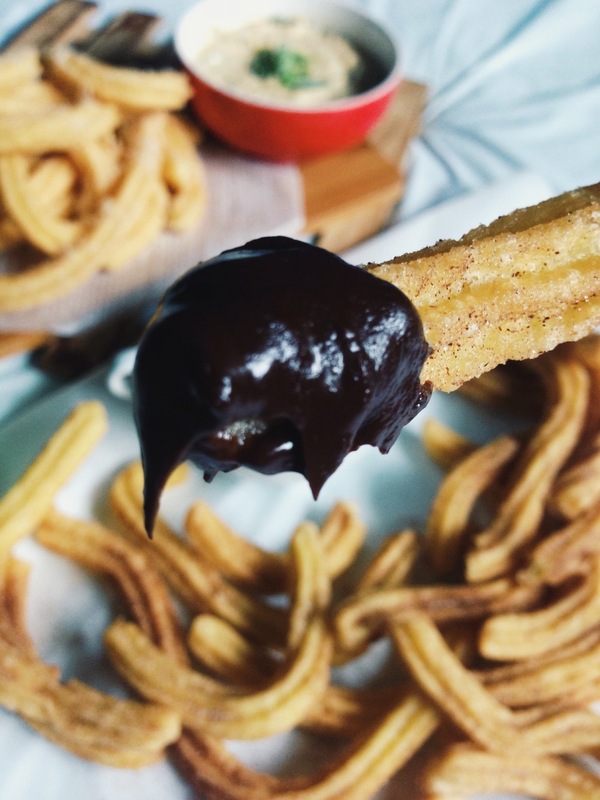 So if you are craving for churros and lazy to head down town for this high price and low cost dessert, why not try this recipe and have some fun at home with your loved ones? Aside from the traditional sweet churros, I did a savory version which turn out pretty amazing. For my savory churros, I toss coated it with finely shredded dried scallops and shrimps, if you do not have those, just salt and pepper will do (like french fries). For the dips, I paired it with Salted Egg Yolk Dip (Asian fusion) and Blu Cheese Dip, feel free to use other dips like french onion dip or spicy mayo etc. One of the main crucial factor in determining whether your churros will turn out good or bad is the control of oil temperature. I tend to maintain my temperature on medium to medium high, but do not go too hot (high). As this will cause your churros to be cooked too fast on the outside while the inside are still not fully cooked through. Start preparing your dough by bringing a cup of water to a slow simmer in a sauce pan, add in the butter, salt and sugar. Stir until butter melts, then add in the flour. Keep stirring until the flour clumps together with the water into a big lump of dough. Cook the raw dough for a few minutes. Take out and set aside to cool for about 5 to 10 minutes. Add in the eggs one at a time and mix it well with the dough (add vanilla essence at this point of time). Transfer the dough to the pastry bag, preheat the oil in a pot. Test if the oil is ready by throwing a small pinch of dough in the oil. If the dough starts to bubble, you are ready to go! Squeeze in the dough slowly and cut the desired length off with a scissors or knife. Feel free to twist and turn the shape to what you want. Let the churros sit in the oil for awhile for the shape to set before turning it. When it turn lightly brown and hard on the outside, your churros should be done (temperature should maintain at medium to medium high). Set it aside to cool on a oil absorbent paper before tossing it with the seasonings (sweet & savory). Prepare the choc sauce by putting it in the microwave for 1.30 mins on high (800w), stir evenly. 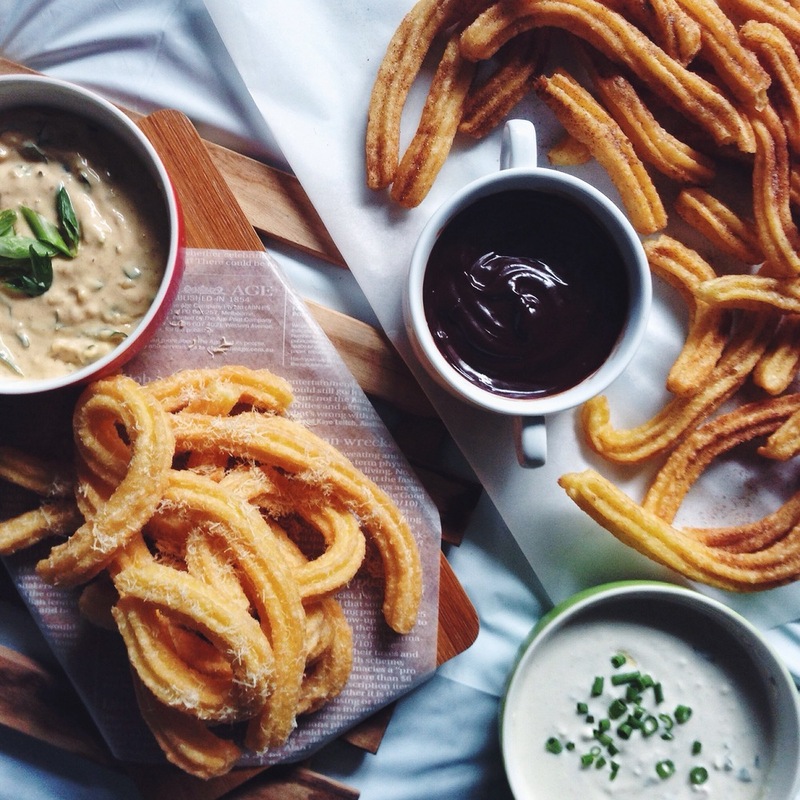 After coating the churros with the seasonings, serve alongside with the dips! and its DONE!